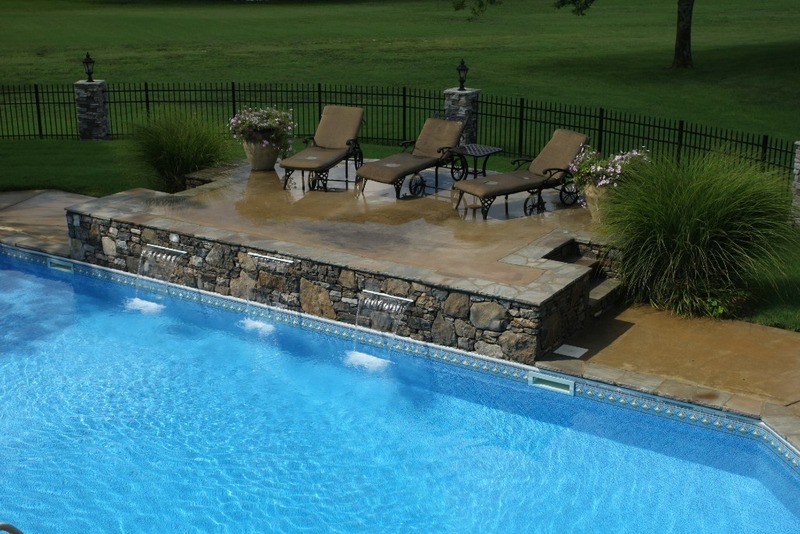 Tanning Ledges Add a Designer's Touch to Your Pool. Tanning ledges are an easy way to lend personality to your pool and enhance the pleasure it provides. Not only do tanning ledges give you an area to sunbathe in lounge chairs inside your pool, but these 10" deep bodies of water are a true multi-purpose addition to any design. Add a bubbler or waterfall and they can be used as a water feature to add a touch of "custom design" visual appeal to your backyard. Do you have children? The little ones love them as well. With their shallow depth, they can function as a water playground for them to splash around in. As parents, tanning ledges help ease the worry of having a child wander off to the deep end. Peace. Of. Mind. Where you choose to put your tanning ledge provides versatility too. They can be used as an interior or exterior element of your overall pool design. We have preformed fiberglass ledges that can be added to a fiberglass or vinyl pool, and we can custom make ledges in both vinyl and concrete pools. There are a number of options available to create this unique area and we can help determine the best fit for your pool. Take a look at just some of the tanning ledges we've installed. With a bit of imagination, your possibilities are virtually endless! If you're considering adding a tanning ledge to your pool, contact us. We'll send you our full color brochure and answer all your questions to ensure you have all the information you need.